Wedding favors are always a great way to thank your guests for attending your wedding and celebrating this big day with you. Choosing the right wedding favors for your wedding can depend on a lot of details, such as the wedding theme, wedding season, the budget, and the bride and groom's personality and hobbies. There are so many ideas when it comes to wedding favors that the options are truly endless. This is why we have created a special section for brides and grooms filled with wedding favor ideas! Click here! To give you some more inspiration, we have some great wedding favor ideas for you to consider for your wedding this year. Make sure you read: Wedding Favor Mistakes to Avoid first. Candles are always a favorite, and usually a big hit for weddings, everyone loves candles - they are useful and will not be thrown away. For more candle favor ideas click here! A cute and simple gift that will stay with your wedding guests for a long time. Your guests will keep this wedding favor for the longest time, also check out more useful wedding favors your guests will love here. Another great and useful wedding favor, seed favors are the perfect parting gift for your wedding guests. Do you like this ideas? 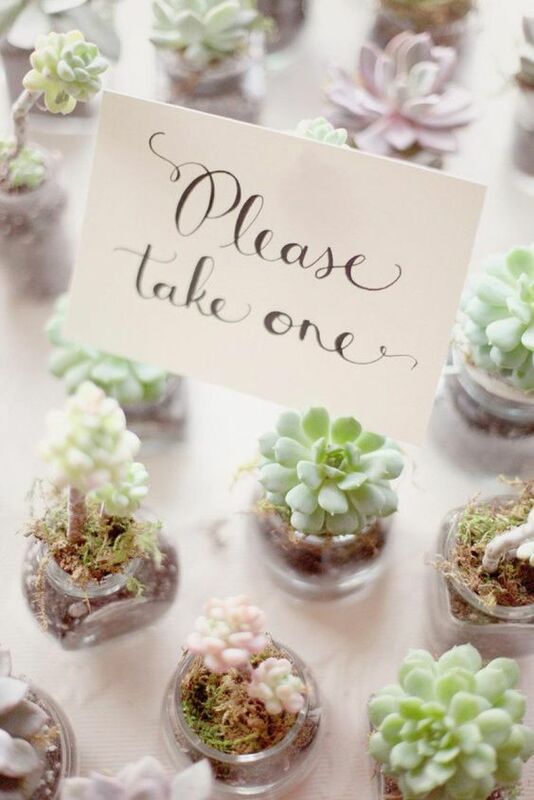 Here are more floral and plant wedding favor ideas for you!